Chihuly at Biltmore, a new exhibition opening at Biltmore in 2018, will feature multi-media artist Dale Chihuly’s monumental glass sculptures. Opening on May 17, 2018, the exhibition will be set throughout areas of Biltmore House, gardens, and grounds. Running through Oct. 7, 2018, the exhibition will display Chihuly’s sculptures in the Winter Garden of Biltmore House, and throughout the estate, including the Italian Garden and Walled Garden. For the first time Biltmore will host an evening experience in the gardens that will offer views of the sculptures after dark. Chihuly Nights at Biltmore will take place each Thursday through Sunday night during the exhibition. 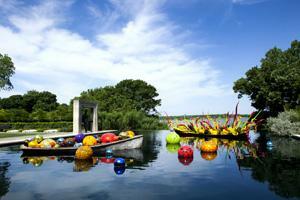 Daytime admission to Chihuly at Biltmore is included in the general admission ticket price. Admission to see Chihuly Nights at Biltmore requires a separate ticket. Tickets are now available at www.biltmore.com/chihuly.